Tour Operates inEnglish, Spanish, Japanese, Mandarin and Korean. When the State Apartments are closed thePrecincts, Queen Marys Dolls House and the Drawings Gallery will continue to be open. St. Georges Chapel is also closed to visitors on Sundays as services are held throughout the day. Worshippers are welcome to attend the services. Queen Marys Dolls House is currently closed until further notice. 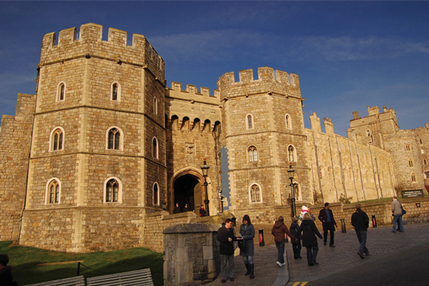 On 18th of June due to Windsor Castle closures, this tour will visit Henry VIIIs former residence Hampton Court Palace instead. When the State Apartments are closed the Precincts, Queen Marys Dolls House and the Drawings Gallery will continue to be open. With an exciting calendar of entertainment, 2014 is another special year in London. Find out what's happening throughout the capital with our thorough guide to the best 2014 London events. From cheap budget accommodation to luxury 5 star suites see our special offers for Golden Tours hotels, including Eccleston Square Hotel London from 78% off.